Zero Sum Game has some strong, subversive ideas, but weak characterisation and a slow-to-hook plot leaves it less than the sum of its parts. 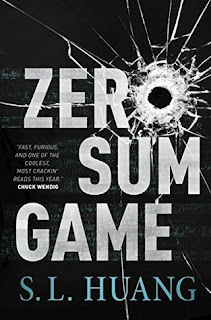 Though it's new to print this year, Zero Sum Game was already on my radar in its previous, ebook only self-published incarnation, although it never made the leap from the ever-growing collection of Kindle Samples I keep around to inform potential purchases onto my actual TBR. This new version, published by Tor, has been revisited and polished up, and is now being released much more widely as part of the publisher's #Fearlesswomen initiative, bringing this unconventional superhero thriller to a bigger audience, and also to me. Our protagonist Cas Russell is a mathematical genius, and a hired gun, but not in the way you'd expect. Far from being your average brains-over-brawn number crunching geek, providing support to a team from behind some giant, poorly lit computer display, her abilities let her calculate the trajectory of bullets, survive falls that should kill her and punch people much larger than her at just the right angle to drop them with minimum necessary force. Cas is extremely cagey about these abilities and keeps them very close to her chest, particularly as she lives in a world where she seems to be the only person who can do this kind of thing. However, after a routine extraction of a young woman from a Colombian drug cartel ends up leading her to an organisation led by someone with even more terrifying abilities, Cas ends up in the middle of a plot that's both more wide ranging and more relevant to her, personally, than she had realised. The way Cas' abilities play out - and, almost as importantly, the way they don't - provides Zero Sum Game with its most unique and compelling facet. Our introduction to her capabilities is almost exclusively through her ability to manipulate real-world mechanics, giving her superhuman combat abilities and problem solving skills which allow her to, for example, move a series of random objects in an alley to manipulate the acoustics enough to hear a conversation happening in a distant room. This is all very cool stuff, and it absolutely sets the scene for Cas as an action hero subversion of the "maths geek" trope. In contrast, Cas' abilities to apply statistical analysis, while also developed in later chapters, take a long time to come to the fore, and importantly they never dominate the way the first-person narrative . Even when Cas does run the probabilities of what the people around her will do, it's embedded in interpersonal and emotional reactions to the situations she's in, and tends to come with a much lower rate of reward than her kickass physics-ninja skills. Cas is bad with people, but she's bad in a generally misanthropic way, not a "human emotions do not compute" way, and this makes for a more interesting character (especially for the purposes of first-person narration). Cas is thrown into an action packed plot which kicks off right from the very first page and never really stops moving. I struggled with this in early chapters, as very little time is spent establishing the limited networks and sense of "normal" in Cas' life before these are ripped away from her in a move which feels rather like the prologue of a Bioware game, motivating her continuing interest in a case that otherwise doesn't hold much long-term appeal for such a self-interested character. It's not until the introduction of the big bad, and her own abilities, that I became more invested in where things were going. Dawna Polk is basically a telepath, in the way that Cas is basically a superhero - while she might not be able to magically read minds, her ability to interpret psychological cues is so good that she's able to read everything a person is thinking and, even more terrifyingly, manipulate the impact that encountering her has on the memories and intentions of others. The uncertainty this brings to what was formerly a fairly standard plot is chilling in all the right ways, and used to great effect both in the book itself and to set up hooks for the rest of the series. Unfortunately, Dawna is a standout character in a story which doesn't really have any others. Even Cas herself is hard to like, and her characterisation is somewhat thin outside of the maths stuff, although some of the gaping holes in her background and motivations do make more sense towards the end. Also, this is yet another book where I was frustrated by the gender balance: besides Cas and Dawna, the only other women turn up near the beginning and are pretty much just there as victims, and there's no non-binary representation. By far my biggest annoyance was Rio, Cas' only "friend", who is supposed to be a compelling sociopath-with-a-code and whose motivations and relationship to Cas come to the fore at several points in the plot. Unfortunately, Rio's main functions are to do horrible things that Cas constantly makes excuses for, and mansplain her own emotions and behaviours to her for her own good. I can't help but note that Huang didn't need to make Rio a sociopath for this to be a plausible set of behaviours for him to exhibit towards a female protagonist, and the effect was far from endearing. Cas' other sidekick is Arthur Tresting, a Private Investigator who comes off better when his counterpoint is Rio, but is otherwise bland at best, getting upstaged by his bit-part hacker friend in the few scenes the friend gets to be in. 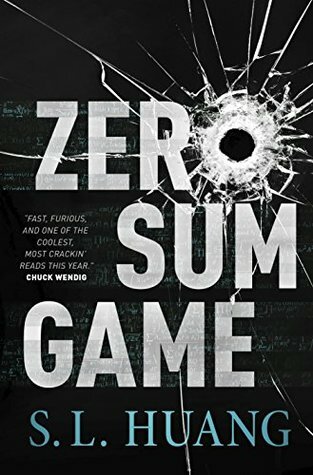 Ultimately, while I can certainly admire the elements that Zero Sum Game does well, for me the good didn't fully outweigh the things I didn't like about this story. Cas and Dawna both have highly compelling powers and are interesting characters in their own right (odd but ultimately justified choices on Cas' part aside), but the plot took a little too long to get its hooks into me, and the supporting protagonists were at best forgettable. For those who are more invested in fast paced action and don't mind the drawbacks I've mentioned here, Zero Sum Game's calculation might work out more in their favour, but alas, it's not going to go down as one of my favourite reading experiences this year.